Give a thoughtful gift to be remembered. 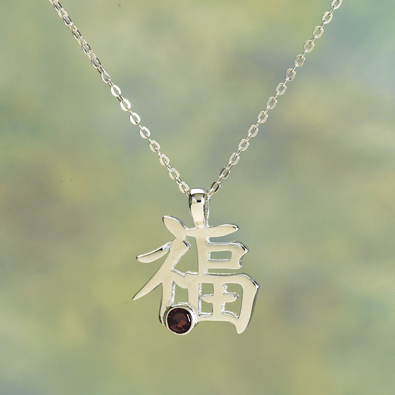 Each of our elegant Chinese calligraphy pendants represents an inspirational symbol and holds a genuine Swarovski® crystal colored according to the month's birthstone (January – Red Garnet). Each is crafted of sterling silver with an 18" sterling silver chain. Choose your favorite based on birth month, stone or the symbol that means the most to you. Give a thoughtful gift to be remembered. Each of our elegant Chinese calligraphy pendants represents an inspirational symbol and holds a genuine Swarovski® crystal colored according to the month's birthstone (April – Iridescent White). Each is crafted of sterling silver with an 18" sterling silver chain. Choose your favorite based on birth month, stone or the symbol that means the most to you. Give a thoughtful gift to be remembered. Each of our elegant Chinese calligraphy pendants represents an inspirational symbol and holds a genuine Swarovski® crystal colored according to the month's birthstone (December– Blue Zircon). Each is crafted of sterling silver with an 18" sterling silver chain. Choose your favorite based on birth month, stone or the symbol that means the most to you. Give a thoughtful gift to be remembered. Each of our elegant Chinese calligraphy pendants represents an inspirational symbol and holds a genuine Swarovski® crystal colored according to the month's birthstone (June – freshwater pearl). Each is crafted of sterling silver with an 18" sterling silver chain. Choose your favorite based on birth month, stone or the symbol that means the most to you. Give a thoughtful gift to be remembered. Each of our elegant Chinese calligraphy pendants represents an inspirational symbol and holds a genuine Swarovski® crystal colored according to the month's birthstone (February – Purple Amethyst). Each is crafted of sterling silver with an 18" sterling silver chain. Choose your favorite based on birth month, stone or the symbol that means the most to you. Give a thoughtful gift to be remembered. Each of our elegant Chinese calligraphy pendants represents an inspirational symbol and holds a genuine Swarovski® crystal colored according to the month's birthstone (November– Yellow Topaz). Each is crafted of sterling silver with an 18" sterling silver chain. Choose your favorite based on birth month, stone or the symbol that means the most to you. Give a thoughtful gift to be remembered. Each of our elegant Chinese calligraphy pendants represents an inspirational symbol and holds a genuine Swarovski® crystal colored according to the month's birthstone (March – Blue Aquamarine). Each is crafted of sterling silver with an 18" sterling silver chain. Choose your favorite based on birth month, stone or the symbol that means the most to you. Give a thoughtful gift to be remembered. Each of our elegant Chinese calligraphy pendants represents an inspirational symbol and holds a genuine Swarovski® crystal colored according to the month's birthstone (September – Blue Sapphire). Each is crafted of sterling silver with an 18" sterling silver chain. Choose your favorite based on birth month, stone or the symbol that means the most to you. Give a thoughtful gift to be remembered. Each of our elegant Chinese calligraphy pendants represents an inspirational symbol and holds a genuine Swarovski® crystal colored according to the month's birthstone (August – Green Peridot). Each is crafted of sterling silver with an 18" sterling silver chain. Choose your favorite based on birth month, stone or the symbol that means the most to you. Give a thoughtful gift to be remembered. Each of our elegant Chinese calligraphy pendants represents an inspirational symbol and holds a genuine Swarovski® crystal colored according to the month's birthstone (July – Ruby). Each is crafted of sterling silver with an 18" sterling silver chain. Choose your favorite based on birth month, stone or the symbol that means the most to you. Give a thoughtful gift to be remembered. Each of our elegant Chinese calligraphy pendants represents an inspirational symbol and holds a genuine Swarovski® crystal colored according to the month's birthstone (October– Pink Rose). Each is crafted of sterling silver with an 18" sterling silver chain. Choose your favorite based on birth month, stone or the symbol that means the most to you. Give a thoughtful gift to be remembered. Each of our elegant Chinese calligraphy pendants represents an inspirational symbol and holds a genuine Swarovski® crystal colored according to the month's birthstone (May – Emerald). Each is crafted of sterling silver with an 18" sterling silver chain. Choose your favorite based on birth month, stone or the symbol that means the most to you.